Chapel Sound is a collective of young musicians based in Vancouver. A doing-it-together collective through and through, they have been evolving and progressing on the dance floors and the living rooms of Vancouver and beyond for the last three years. Formed from a number of smaller groups operating in the same general sonic areas, Chapel is one entity with many facets where the lines blur and new ideas form. From their humble beginnings of two turntables and a lava lamp to global recognition, they’re excited to share sounds from their friends and family on their first compilation. Stream and download the first ever Chapel Sound Compilation Vol. 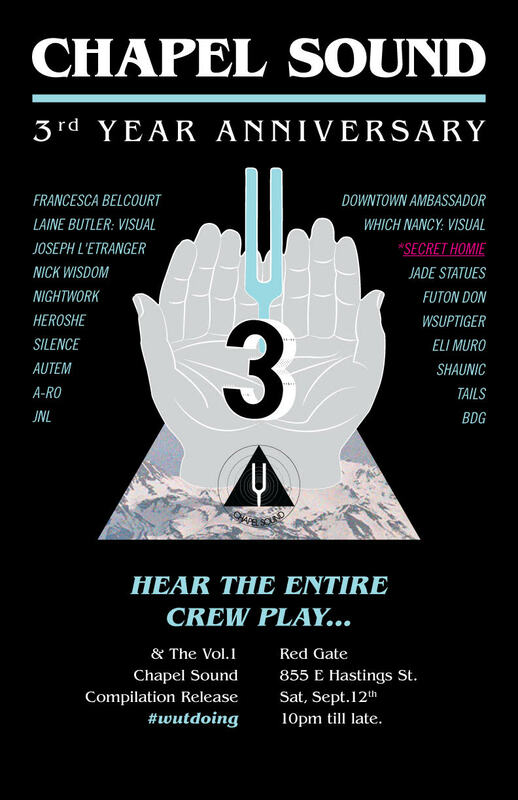 1 now and celebrate their three year milestone this Saturday, September 12 at the Red Gate.